The unique design of our Bussey-Saksida Touch Screen Systems more easily focuses the subject’s attention on the desired task, resulting in a dramatic decrease in necessary learning time. 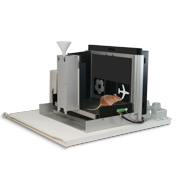 With our Bussey-Saksida Touch Screen System, you can run a variety of operant tasks using the same chamber, with chamber configuration time of mere seconds. Through our advanced software, usage and editing of paradigms enable a more diverse array of available tasks. 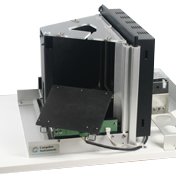 The photo at right illustrates a custom Easy-Install package (Model 80614-21) that integrates the use of touch screen chambers with CMA microdialysis components for sampling in the extracellular space. As shown in this image our design enables the lines to the animals to be as short as possible (the entry point to the chamber is on the same side as the connection panel and cooling fan). 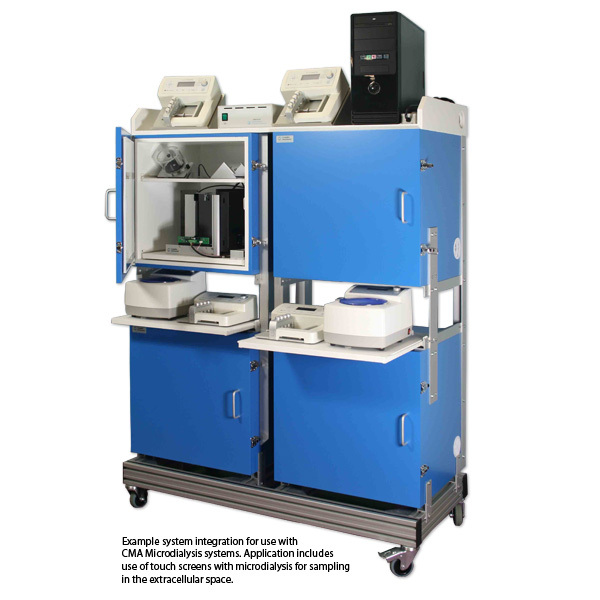 The microdialysis carousel shelves for the lower chambers can be rolled in and out as needed. Microdialysis components not included. 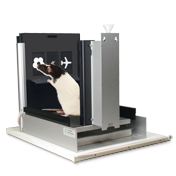 For more information, view our Bussey-Saksida Rodent Touch System Brochure.